February is usually when I start thinking about roses…everything about roses! Trimming, feeding, and buying more, of course!! While out walking an hour or so ago, I had started thinking about what I wanted to write about…ROSES, I thought, and some new ones I wanted to order and where can I put them in the garden? All this was rambling around in my head. Arriving back at the gravel driveway, I checked the mailbox, and there it was…the 2015 catalog from the Antique Rose Emporium in Brenham, Texas. That was surely a twilight moment! 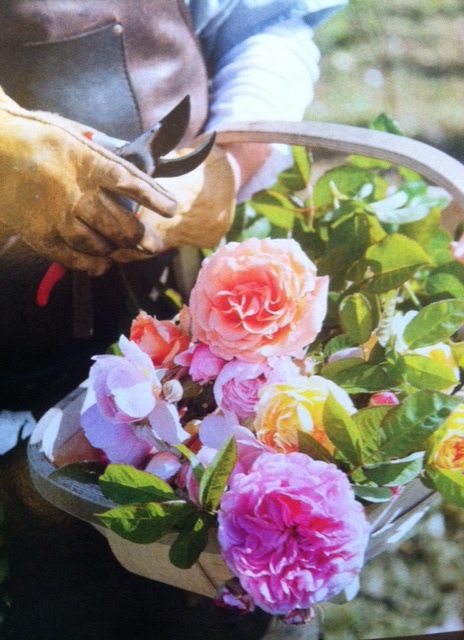 When choosing roses to plant...there are so many to love…I usually decide based on color, fragrance, ease of care and repeat blooming. All spring and summer I enjoy picking blooms to bring in the house to make small bouquets. 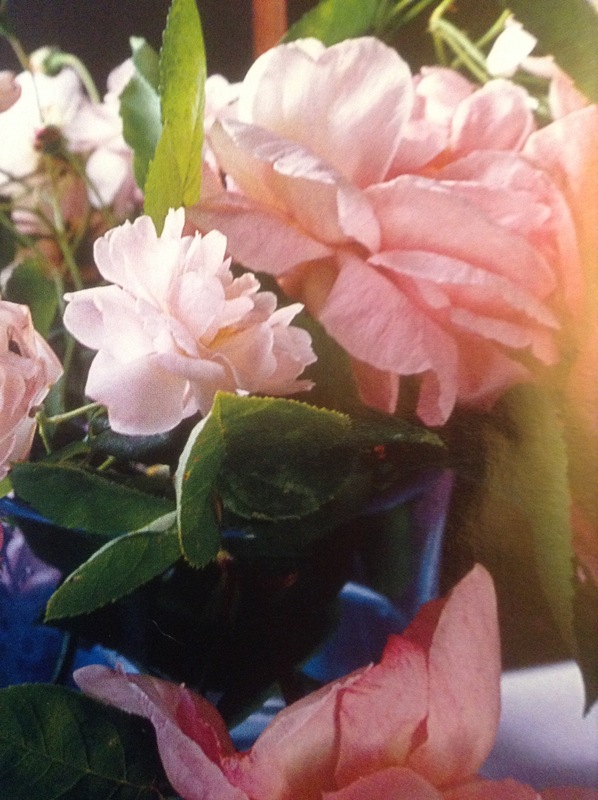 With a few herbs, these little bursts of fragrance and color sit on tables in my living room and by my bedside…from others I pluck petals and let them dry to use for making rose petal scones and rose water. A few roses I’m pondering are DUCHER, a subtle white rose which grew to over 6′ in my Texas garden, a creamy yellow blossom called JULIA CHILD, of course, and Mme. ALFRED CARRIERE, a blush pink climber I also had in my country garden. Decision made, I place my order! The UPS driver is quite familiar with my driveway and Holly! After the gray days of winter, the first stirrings of spring are an uplifting sight in the garden as they happen…leaves and petals stay embraced in their protective cover while waiting for the symphony to begin: nodding hellebores, the sweetness of primrose, colorful crocus, delicate violets…the sleeping garden slowly begins to stir as spears of green knife their way through the earth punctuating the musical explosions. Slowly but surely…so much is written about the stresses of life today, everyone is in such a rush and all their wants/needs must be instantly gratified. Gardeners have no concept of the word “hurry” when standing amongst the glory of spring…they know that everything develops at its own pace as we just watch nature happen. At the HEART of the matter is love…Love for all things God has created and given, love for family and friends, love for and in my garden…throughout my home and garden I include hearts of all sizes and materials. Having collected my HEARTS for over 40 years, I have some wonders to enjoy. On the tool shed door, by the back door, over the kitchen window, pins to wear…and for a Valentine’s treat, a lemon tart with tiny strawberry “hearts”…and fabric hearts filled with deliciously fragrant lavender buds to scent the linen cupboard. Remember the birds living in your yard…give a bit of love to them with some seeds and nut butter treats!! The thermometer on the porch hovers just above 50 degrees…I am outside enjoying the day…and also soaking up some Vitamin D.
Rounding a curve on the PATH…I love the one shown here…passing a terra cotta container holding a plethora of pansies tumbling over the edge…French thyme and chives adding more fragrance and texture to the “pot” and as I got closer to the bench, heard rustling and chomping from inside a huge camellia bush full of luscious pink blooms. We startled each other…a yearling doe with innocent eyes dashed away towards the woods, a pink bloom hanging from her mouth. Usually the deer do not bother my plants , mainly because I feed them molasses corn, I’m sure…and Holly usually marks a line along the woods as she takes her morning relief walk. So I guess the lure of beautiful and tasty camellia blooms was just too much to ignore. Early Risers…Near the stones, tiny green tips of hyacinth and wood iris are pushing through the mulch…eager for spring. Masses of snowdrops under the bare trees will soon happily announce that winter’s end is near. Interplanted with crocus and early daffodils, the area in the center of the gravel driveway will soon offer an ecstatic gardening moment of color and bloom. Simple Pleasures…something to create for your Valentine’s Day sweet table…I found this photo idea in a British magazine and just love the simplicity…and the fact you can make it yourself! You simply need some antique plates in graduated sizes, a few liqueur glasses to go between and a lovely teacup and saucer for the top. Use a glass-bonding glue to put it all together…Viola! You can use the same china plate pattern or a variety of plates and patterns and edge trims as shown in the photo. This is such a clever idea for using those odd plates and glasses easily found at flea markets. The old metal tray with hand painted flowers is one of several…the knife box something I found 30 years ago at an antique shop in Frederick, Maryland. As you can see in the close-up photo, I love to combine many collections and pieces found in my traveling and antique searching. The Blue Willow cream pitcher is from England, the espresso cups are from an Italian coffee bar, the plates in the background are over 100 years old…and still look great!! My Santon came from a shop in Ax-en-Provence which makes these specialty figures. Part of my enjoyment here is taking each piece down, cleaning it and thinking back to where and when I found my treasure and what made me buy it. I rarely re-arrange the collections as I feel that after several iterations, I have found a good balance of size, pattern and color. Speaking of Cleaning…Most of you know how strongly I oppose using synthetic chemicals for cleaning your home, especially when there are so many good alternatives available…along with all the simple household products easily used for cleaning…white vinegar, baking soda, lemons, borax, essential oils and such. AND, for years I have written about the dangers of too many chemical antibacterial formulas being used, especially on children. Again, there are many herb based “soaps” or hand cleaners that are much safer to use. I am very encouraged to read about doctors now warning of the danger of too many antibacterials used on children today! Well finally! So check that “hand sanitizer” in your purse…then go to Whole Foods or Trader Joe’s or other natural foods markets and find an alcohol-free, better product. I keep lavender based hand cleaner in my car and use it every time I get gas or use a shopping cart…and also rub it on the steering wheel. Small things that can make a big difference…a good clean out and straightening of the linen closet does a lot for winter blues. This is a real treat for me and find myself doing this for my daughters almost every time I visit! Labeling shelves for different size sheets is a must for easy organization…and pillowcases are best stored separately by size. Old linen pillowcases that are rarely used look lovely when stacked and tied with ribbon. To keep the closet sweet smelling and free of moths…use lavender filled muslin bags sitting on the linens on each shelf as well as big chunks of homemade lavender soap sitting in a basket on several shelves. To open a linen closet and find a very fragrant, neat and orderly, crisp pile of linens, well, that gives the appearance of a well-ordered household…and a homekeeper who appreciates the beauty and scent of her fine linens every time she changes the bedsheets. 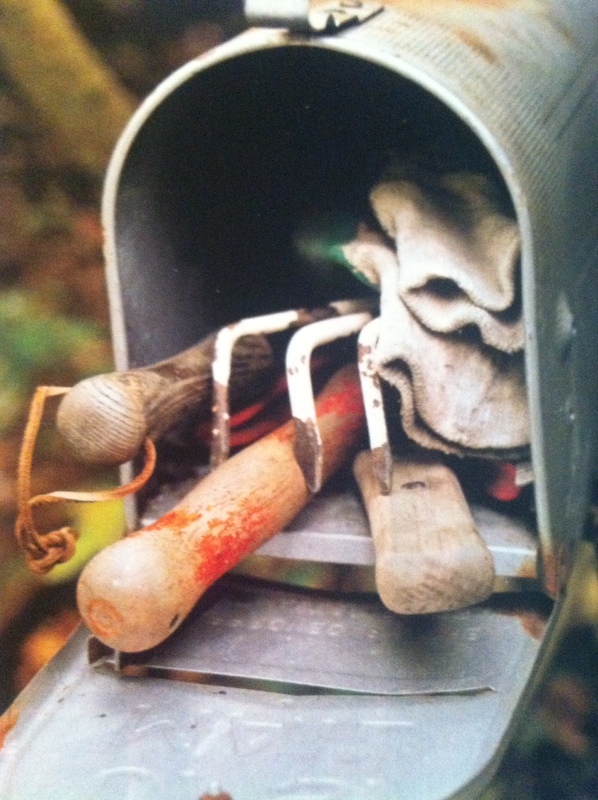 I installed several old mailboxes throughout the garden…it’s easy to leave gloves and tools for when I walk the garden and feel compelled to dig! 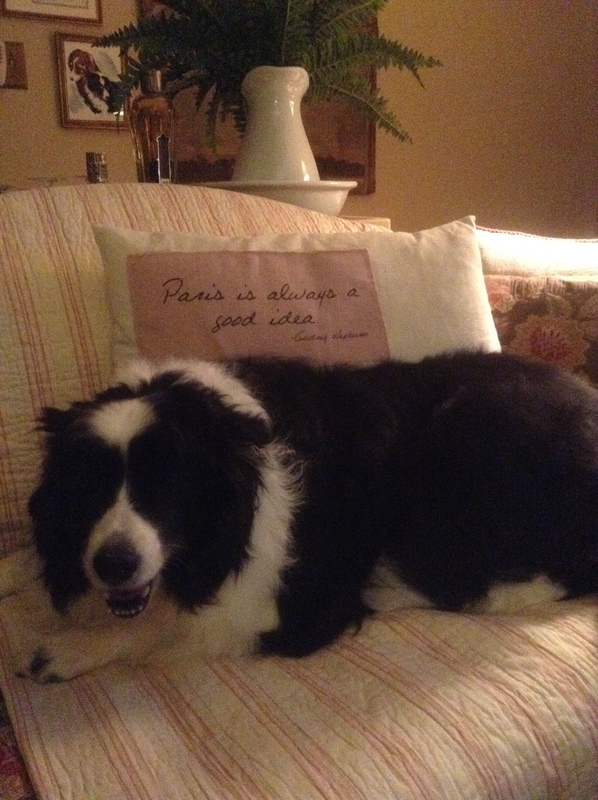 St. Valentine’s coming soon…LOVE to all from HOLLY and me!